The HydroZone at Edenderry Swimming Pool includes the use of our purpose design and built 8 person Ice Cold water bath; FULLY FILTRATED SYSTEM, with TOTAL BODY COVERAGE. Temperatures of 2 °C to a maximum temperature of 24 °C. (Bath dimensions 2.6 m x 2 m x 1.4 m deep). During body cooling water is continously circulated to enhance water - to - skin temperature gradient, which optimises cooling. Our Purpose Built ICE Chiller Bath - Seated and Circulated. Saunas have very low humidity, which means they can be much hotter than steam rooms. They're usually between 80°C and 100°C. 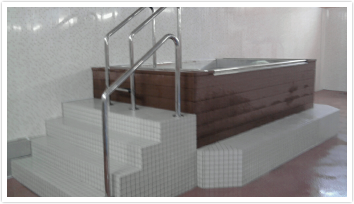 Our steam room is set about 40°C and is suitable for up to 10 persons.. But both Sauna and steam baths both have therapeutic benefits.